When it comes to discovery and healthcare advancements, too many of us are more focused on the processes we use today rather than at a first principals level looking and what’s possible. We are a sector desperately in need of disruption to accelerate the generation of knowledge and lower the costs of developing new treatments for patients today. We need to ask what are the best ways to generate actionable evidence that can benefit patients, clinicians, payers and regulators. We need to take an integrated approach to biology and treatment discovery. Large-scale approaches like genetics, the biome, metabolomics, and proteomics are coming down in price faster than the famous Moors law that has driven computer improvements. These tools are beginning to allow us to understand the biological variation that makes up each of us. This is the technology I used at ALS TDI; the organization I founded, to help learn about the early changes in ALS. This emerging technology needs to be met with well-measured human outcomes. PatientsLikeMe is working to build that network. Our goal is to be a virtual global registry with millions of individuals sharing health information, translated into every language and normalized to local traditions fully integrated into the medical system so it’s part of care and incorporates information from the electronic medical record, imaging, diagnostics and emerging technologies for interrogating biology. We are doing this because to understand the biology of disease we needed to understand the experience of disease with the patients as true research partners. This isn’t just about integrating biological methods to forge discovery. You can’t just consider the science; you also have to consider the person. No two health journeys are exactly the same. With integrated biology, you have to look at the whole person: their social interactions, socioeconomic status, comorbities, environmental impacts, lifestyle factors, geographical location, etc. To accurately model a condition like ALS, or any of the other 2,300 conditions that PatientsLikeMe members are living with, we need to understand everything that can impact progression. We need to use those real-world patient experiences to inform and improve the drug discovery process. There is much that needs to be solved to move from our current siloed approach to the integrated one and we have had the privilege of being involved in one of the most innovative. Orion Bionetworks brought together leaders from across the MS Field to develop an integrated model of the disease and they are now moving forward with an even more ambitious project. They’re using computational predictive modeling to bring together different scientific methods and big patient data to find treatments that work and biomarkers that measure them to the people that need them faster. Said differently, they are hacking their way to treatments, because that’s the only way it’s going to work. They’ve already got a validated model: Orion MS 1.0. And now they want to develop a new Orion MS 2.0 model. Learn more about their #HackMS campaign and how you can help. We are highlighting Orion here because what they are doing is so innovative and worthy of support. I donate to ALS TDI, the institution I founded, because I believe in the mission and their approach. I also have donated to Orion because if we need to do anything in discovery we need to support the people that are trying to do it differently. What they are proposing is so innovative and powerful in its scale that it has the potential to redefine how we understand and treat MS. That’s why we are partners with them and it’s how we meet our responsibility to our MS patients to use their data for good. Between the Ice Bucket Challenge and movies like “You’re Not You” (about a classical pianist who is diagnosed with ALS), there has been a ton of awareness going on for ALS, with many efforts focused on the personal stories of people living with the neurological condition. And this month, ALS is being spotlighted again in a biographical movie coming out very soon. “The Theory of Everything” is about the life of renowned physicist Stephen Hawking, who has been living with ALS since the 1960s. 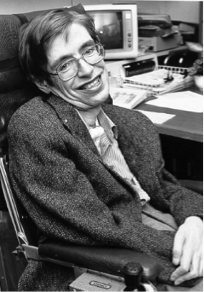 Despite being given a grim diagnosis, he defied all odds and became one of the leading experts on theoretical physics and cosmology. Stephen Hawking’s story reminds us of the reality of ALS, but is also an inspiration to all who are living with motor neuron disease. The movie premieres on November 7th in the U.S. – check out the trailer below. As many out there might already now, movies like “You’re Not You” and “The Theory of Everything” hit close to home for the PatientsLikeMe family. In 1998, Stephen Heywood, the brother of our co-founders Ben and Jamie, was diagnosed with ALS. Their experiences – as a patient, as caregivers, and as a family led to the beginning of the online community patientslikeme.com. Share this post on Twitter and help spread the word for ALS.